Undergraduate- or graduate-level students submit an original article to us about some aspect of instructional design. If we choose to publish it in our newsletter, IDeaL: Design for Learning, the student receives a complimentary STC student membership, which includes a membership in the IDL Special Interest Group (SIG). With the student’s permission, once we publish their article we will submit it to STC’s Technical Communication Body of Knowledge (TCBOK). If the editors decide to include the student’s article in the TCBOK, he or she earns an additional year’s STC/IDL membership (or an equivalent award if they no longer qualify for student membership because they’ve graduated). Once published, students can link to their article from their résumé and possibly on their LinkedIn profile page—ideally gaining an edge in becoming employed after graduation. Print the attached flier and post it where students will see it. Mention the opportunity when your class meets. Forward this email and attachment to students. Stress the deadline of December 31, 2016. 17 May 2016: prizes presented at the STC Summit Honors Reception, Anaheim, CA. Tavia Record, a student member of the Orlando Central Florida chapter, has published an interview with incoming STC president Bernard Aschwanden: "An Interview with the Incoming STC President"
By Pam Estes Brewer, SIG Manager The Academic SIG is flourishing! When I think about where we have come in the last three years, I am amazed. Even more amazing is that we have fun doing it. Here are just a few highlights from the past year. We have: • Launched an electronic newsletter. 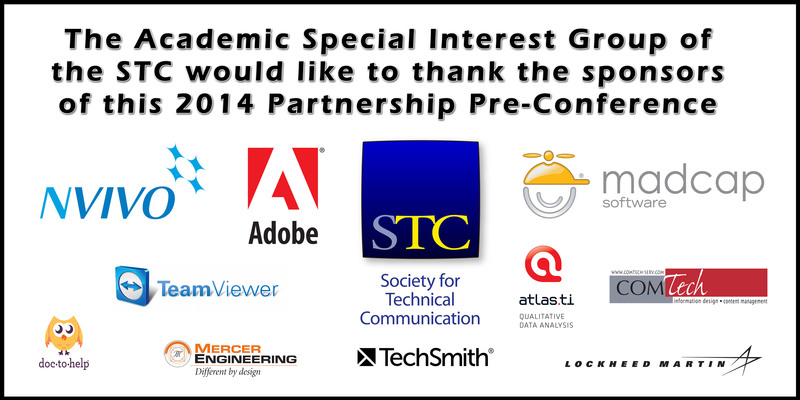 • Offered the Academic SIG Partnership Pre-Conference for a fourth year to an audience of 70+ technical communication professionals, educators, and students. The 2014 pre-conference was held 25 September in Colorado Springs. It ran back to back with CPTSC and ACM SIGDOC—three conferences together. • Launched the third annual Student Poster Competition for the STC Summit, complete with great prizes and incentives (besides the incredible opportunity to network). • Welcomed a new Assistant Manager for the SIG, Dr. Lisa Meloncon. This is the result of our first annual election. • Supported the regeneration of the STC Body of Knowledge. • Piloted a MentorBoard for students and academics. • Coordinated efforts with the STC Board that have resulted in all student members’ receiving a complimentary membership to the SIG with their Society membership. We want to be the welcoming point for students. • Seen our members win a number of research and teaching awards including the Frank R. Smith and Gould awards. In the coming year, we plan to expand our efforts to: • Establish a research grant or scholarship and pursue funding to enrich these offerings. • Offer webinars of interest to students and educators. • Pursue a rejuvenated Academic Programs database. • Build a critical mass for the MentorBoard. • Build our presence in social media. • Make sure that our membership receives excellent opportunities that support them professionally. I want to place exclamation points everywhere because we are doing outstanding work and making connections for our membership. And for the first time, we have talented people just waiting for opportunities to contribute to our initiatives. The STC Academic SIG is the place to be. We want you to be a part of our mission: The STC Academic SIG is a community of educators, practitioners, and students. We mentor young professionals to become future leaders in the field of technical communication and support the exchange of knowledge between academia and industry. Register now for the STC Academic SIG Pre-Conference on 25 September 2014, the day before the CPTSC Conference, at the University of Colorado at Colorado Springs. The Pre-Conference is free of charge. Online registration is available until 16 September 2014; after that date, registration will be taken at the door. The Pre-Conference format has changed this year: it is shorter (12:45 pm - 5:15pm) and features concurrent sessions and technology workshops. You can view the overall schedule here, and read about the sessions and presenters here.